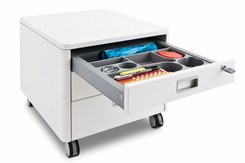 This rolling storage cube with drawers fits under the Champion Desk and doubles as an extra seat. Add an optional Storage Cube Cushion and turn the cube into a fun seat. The sturdy child-friendly construction makes this the perfect storage solution for a child's bedroom, playroom or family room. Organize school supplies, crafts and toys in the roomy drawers. 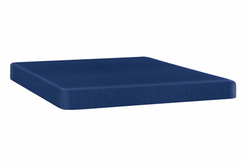 This comfortable seat pad fits atop the Champion Cubic Container. Moll Desks USA, A Division of Bindertek, Inc.